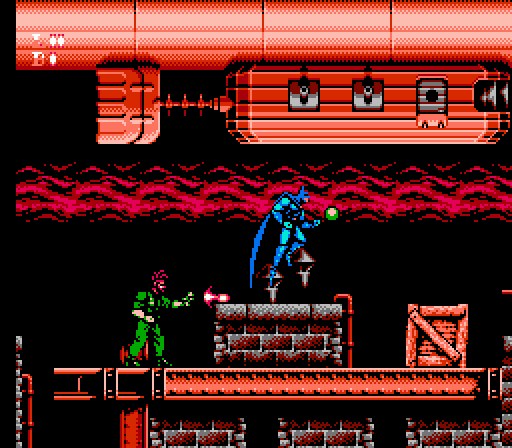 Batman: Return of the Joker (known as Dynamite Batman in Japan) is an action platformer and the follow-up to the 1989 NES original. You have fire and slide attacks you can use but there's also upgrades available in crates including a Cross Bow and Sonic Neutraliser. These are more powerful and can be charged by holding down the B button. However, you can only hold one item at a time and it's a shame that you can no longer switch between weapons like in the 1989 original. You can also hold down on the d-pad to duck but it's completely pointless as Batman's sprite is so large that enemy bullets will still hit you 100% of the time. Instead you'll have to jump over incoming fire and attempt to manoeuvre using the stiff in-air controls. It's tricky to adjust your jump and the controls are very unresponsive. Enemy placement is another huge issue as they're always located directly after a jump or as soon as you step on a moving platform. You can't even position yourself so they're slightly on screen as the game won't register a hit unless the enemy is fully visible. If you couple this with the terrible level design the whole game feels like a test of patience as you experience cheap hit after cheap hit. What's strange is that the bosses aren't particularly difficult - the Stage 1 boss is a complete pushover as you have more life than him meaning you can simply button mash without any regard for your wellbeing. The game's graphics are nicely detailed though with some large sprites. Sunsoft also tried to add some variety as there's a mixture of side scrolling, automatic scrolling and even shoot-em-up levels. Unfortunately all of this is moot as the game is ruined by poor controls and flawed design choices. Batman: Return of the Joker is a huge step back for the series on the NES and the whole game just feels shoddy, lazy and lacking any inspiration. Do yourself a favour and play the 1989 original instead - this one is only for the curious and die-hard fans of the superhero. Random trivia: Versions of Batman: Return of the Joker were also released for the Sega Mega Drive and Nintendo Game Boy. A planned SNES version was cancelled but a prototype rom is available online.